While we have continuously, in decibels that drown out everything else, heard the story of the exploits of the European settlers and colonial administrations at the Cape, I have presented a few potted-pen stories in previous postings on the indigene Khoena and San, their resistance, their role as the true foun ders of the City of Cape Town and the bedrock they give the African roots of ‘Coloured’ identity. I have also related the story of the diversity of the slaves brought to the Cape from Africa, Madagascar, India, Indonesia, China and elsewhere, who quickly became the majority population at the Cape of Good Hope by the mid-18th century, and further; related the story of the migrations of Indonesian Resistance Exiles, Peranakan Chinese exiles and convicts, as well as; stories of the apprenticed ‘Prize Slaves’ and the 19th century Indentured Labourers from Malawi, Botswana, Mozambique and Zimbabwe. I went on to look at the Philippine exiles known as the Manillas, the Passenger Indians to the Cape who arrived long before the Indentured Indian migrants in KZN, the Mazbieker story, the Royal Navy Kroomen and Siddis story – and now this posting deals with those migrants whom we locally called ‘The Saints’ from St Helena. These are but some of the hidden stories behind our genetic enrichment and contributions towards our own Cape creole or Camissa culture in the Western Cape. This is also the true story of how Cape Town, its suburbs, small towns and farmlands were built. Without the people of these stories there is no way that white settlers would have survived or developed the infrastructure we enjoy today. This inter-reliance is muted in dominant historical narratives as are the amazing stories of non-conformist European settlers who intermarried and in many cases made common cause with the struggles of people of colour. My argument has always been that we will only truly be able to build one united South African nation when the true history and heritage of South Africa is embraced proudly by all. We are a long way from this because too much is still hidden or denied. St Helena island and its two dependencies Ascension island and Tristan da Cunha islands feature large in its relationship to South Africa and the Western Cape in particular. St Helena island was unpopulated when it was first found in 1502 by the Portuguese. From 1588 the British began to use St Helena as a port of call for all of their vessels travelling to the East. But then in 1633 the Dutch formally annexed the island but did not follow through and occupy it. The British had done a similar thing at the Cape of Good Hope in 1614 and 1620 without following through on permanent occupation. So after the Dutch set up a manned fortification at the Cape in 1652, the British did likewise on St Helena. Oliver Cromwell, Lord Protector of the Commonwealth at the time of the deposing of the Monarchy in England, granted the British East India Company a charter to govern St Helena, as though it were part of England “in the same manner as East Greenwich in the County of Kent”. Over time the BEIC evolved into the United Company of Merchants of England Trading to the East Indies and then finally became the United East India Company. It was under the UEIC that Chinese from Canton were brought to the island. In 1672 a Dutch fleet of ships led by Jacob de Gens set out from the Cape of Good Hope to take St Helena from the British. They defeated the British settlement and the settlers evacuated, but in May of the following year in a counter attack the British routed the Dutch and regained control. There are strong parallels to developments at the Cape. The BEIC-UEIC norms were very similar to the VOC (Dutch East India Company). By 1723 out of the total population of 1 110 some 610 were slaves from India, Indonesia, Madagascar and East Africa. Almost 100 years later in 1817 the census showed that there was 821 settlers plus a garrison of 820. The majority of the population however comprised of 500 Free Blacks, 600 indentured Chinese workers, and 1 540 slaves, both creole and from Africa and the East. Slavery was gradually reduced from 1823 and then in 1832 the UEIC abolished slavery and in 1836 the status of St Helena changed to become a Crown Colony. However as at the Cape, the Royal Navy deposited ‘Prize Slaves’, mainly Africans, on the island and these became indentured servants and labourers. The ‘Saints’ as St Helena people are known thus have similar diverse roots as we have here in the Cape. In 1795 as a result of the conflict in Europe involving England, France and Holland, Governor Brookes and his Council of War in St Helena, assembled a St Helena Force of 600 settlers and slaves to attack the Cape using United East India Company ships. The British Crown however had already assembled an invasion fleet and the St Helena Corps joined the invasion force which took part in the Battle of Muizenberg in August 1796. It is likely that the first ‘Saints’ to stay on in the Cape go back to the time of this invasion. The next of the ‘Saints’ to arrive in the Cape were those that became unemployed as result of the changes and economic pinch experience by the change over from the UEIC rule to direct Crown rule in 1836. The population in St Helena gradually fell from 6 150 in 1817 to less than 4 000 in 1890. There was also a close working relationship between the Royal Navy bases at Jamestown in St Helena and Simonstown in the Cape, particularly in the policing the then illegal slave trade on the high seas, as well the management of the large numbers of ‘Prize Slave Cargoes’ that were seized from slaver ships. Around 26 000 ‘Prize Slaves’ were brought to St Helena between 1840 – 1874 and around 8 000 – 12 000 to the Cape between 1808 and 1856. The Royal Navy seized over 1 600 slaver ships. Many of the ‘Prize Slaves’ interned in St Helena were given passage to the West Indies while others underwent compulsory apprenticeships in St Helena as they did in the Cape. 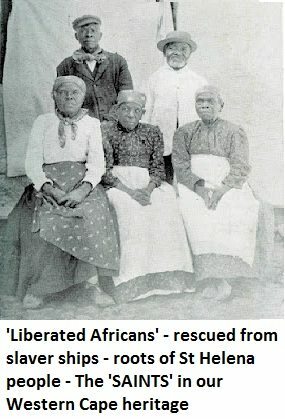 In St Helena as differently from the title ‘Prize Slaves’ used at the Cape, the rescued slaves were called ‘Liberated Africans’. Some of these ‘Liberated Africans’ through working for the Royal Navy would also have landed up in Simonstown. Thousands of ‘Liberated Africans’ were also in such a state of poor health that they died in the internment camps in St Helena. In 1838 over 100 young men made their way to South Africa as a group in the first of increasingly larger groups to do so. In 1869 with the opening of the Suez Canal, St Helena took a further knock and emigration to South Africa increased with ‘Saints’ increasingly taking on jobs as indentured servants and labourers particularly in Cape Town and the farmlands of the Western Cape. Throughout the 20th century up to the advent of Apartheid ‘saints’ continued to migrate to Cape Town and Durban. Apartheid made South Africa less desirable and after the second world war, England, the USA, Australia and Canada became better options as Apartheid South Africa saw the majority of ‘Saints’ as ‘Coloured’. St Helena island was the place of banishment of Napoleon Boneparte. It was also the place of banishment of Zulu King Dinizulu and his entourage for over 7 years. Some of the Zulu royal family were born on the Island. From 1900 to 1902 during the Anglo-Boer War 6 000 Boer prisoners of war were interned on the island at Deadwood Plain and Broad bottom. Many more families in Cape Town and indeed in South Africa, across all population groups, than those aware of their ‘Saints’ ancestors, are descendants of different waves of ‘Saints’ migrants to the Cape. The largest numbers came as indentured servants and agricultural workers to the Western Cape between 1838 and 1915 and integrated into the population who were labelled ‘Coloured’. The history of St Helena is riddled with all of the most difficult and painful elements of class and colour struggles just the same as those struggles in the Cape. Likewise the ‘Saints’ in St Helena, particularly with slavery and indentureship backgrounds also showed fortitude in rising up above adversity. These are the ties that bind us. The history of the ‘Saints’ in our heritage deserves greater exposure. Many are today rediscovering these roots and engaging in cooperation with the islanders of St Helena today in researching these ties. The ‘Saints’ are yet another of the threads that make up our tapestry heritage.